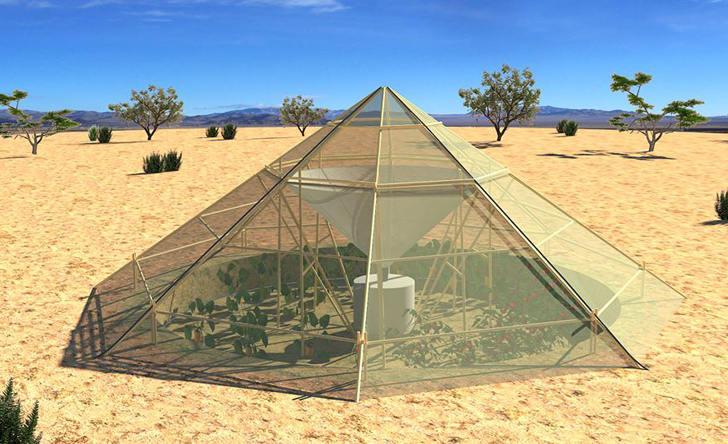 The Roots Up’s Dew Collector greenhouse can help farmers in arid climates raise fresh vegetables, even during droughts. 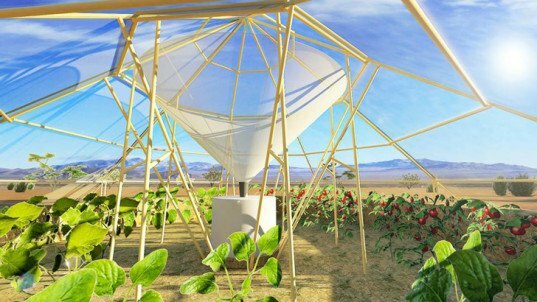 Dedicated to creating a system of self-reliant farms in Ethiopia, the greenhouse helps to collect dew that would otherwise evaporate into the atmosphere. With the dew collector, farmers can raise protected plants, and yield clean water for both irrigation and drinking. The dome-like greenhouse is activated when temperatures increase in the noon sun, causing water to evaporate and rise. With the humidity contained, the top point of the structure catches this evaporation before it’s able to escape into the atmosphere. As night falls, the greenhouse top is then opened by pulling the ropes attached to the latch, exposing the collected droplets to cool air. Those droplets then cool and condense, falling into a storage cistern. The collected water can then be used for watering plants, or as safe drinking water. This system can be repeated each day, allowing plants to thrive while excess moisture is captured and saved for future use. Instead of solely being used as a greenhouse, this can also be used as a rainwater collector, ensuring that precious raindrops are saved and stored, instead of absorbing into the ground. Roots Up plans to launch its first series of Dew Collector greenhouses in Northern Ethiopia, in conjunction with the University of Gondar. The Dew Collector is just one part of the company‘s mission to help create a self-reliant farming community in Northern Ethiopia. You can help fund the project by visiting Roots Up’s Indiegogo page here. Sorry. This is not supported by fact or science. So many ecological and physiological plant issues to consider. Let us see a video and metrics before you set it up in Ethiopia. Ecological solutions are needed, not more technological distractions using scarce resources. it is really great idea!! The dome-like greenhouse is activated when temperatures increase in the noon sun, causing water to evaporate and rise. With the humidity contained, the top point of the greenhouse catches this evaporation before it's able to escape into the atmosphere. As night falls, the greenhouse top is then opened by pulling the ropes attached to the latch, exposing the collected droplets to cool air. The droplets then cool and condense, falling into a storage cistern. The collected water can then be used for watering plants, or as safe drinking water. The system continues each day, allowing plants to thrive, awhile capturing all of the excess moisture and saving it for future use. The greenhouse can also be used as a rainwater collector, ensuring precious raindrops are saved and stored, instead of absorbing into the ground. Roots Up plans to launch its first series of Dew Collector greenhouses in Northern Ethiopia, in conjunction with the University of Gondar. The Dew Collector is just one part of Roots Up’s mission to help create a self-reliant farming community in Northern Ethiopia.